As summarized in the “Historical” section of the chart below, a Hypothetical Law Firm (“HLF”) with overall profit margins of 30%, has provided $10M worth of litigation discovery services to a Hypothetical Sophisticated Client (“HSC”) creating a $3M contribution to partner profits for each of the last several years. Recently, the costs of document review (a subset of overall litigation discovery services) for clients using LPO vendors have fallen to approximately two thirds of the cost of similar services from firms like HLF. If economic theory applies to the legal market (as it increasingly does) then the market price for document review will fall to the price offered by LPO vendors, and HLF will have to compete at the lower price. 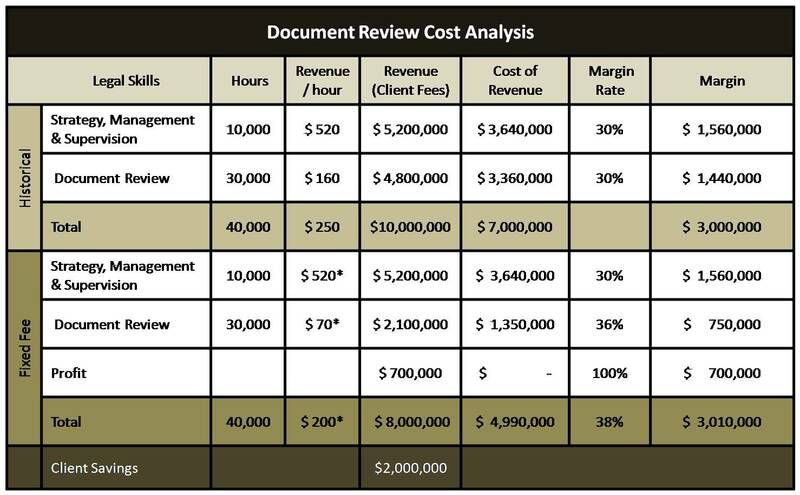 FN1 As a result, falling document review prices will reduce HLF revenue for document review by one third, and even if HLF maintains 30% margins on lower revenue, LPO-vendor-conducted services, the reduced revenue of $6.7M would contribute only $2M ($6.7M * 30%) to profits per partner – a reduction in document review profits of 33% ($3M – $2M = $1M) in actual dollar terms. As shown in the Fixed Fee section of the chart below, HLF is able to offer lower prices and maintain its margins by charging a fixed fee and restructuring its operations to use an LPO vendor. FN2 Assume HSC has historically been billed $10M annually for document review services that were, on average, composed of 40,000 hours at a blended rate of $250. HLF could quote document review services at $8M as an incentive to win most of HSC’s litigation expenditure. The quote may or may not be part of a larger proposal for all legal services for HSC, and may or may not be itemized within the proposal. Once HSC and HLF have agreed to an $8M fixed fee for document review services, HLF could then use legal process outsourcing to help manage costs. In Should GCs Retain LPO Vendors Directly or Through Law Firms?, I outlined a model that assumes three types of skills for discovery reviews: (1) Review Skills, (2) Management & Supervision Skills, and (3) Legal Strategy Skills. Suppose that an analysis of the skill categories found that Review is 70% of the work and that Management & Supervision and Strategy combined are 30% of the work. Also assume the hypothetical traditional hourly billing revenues of $10M resulted from an average of 10,000 hours of Management & Supervision and Strategy efforts at an average of $520 per hour (total $5.2M) and an average 30,000 hours of Review at $160 an hour (total $4.8M). Assume constant 30% margins and resulting profits of $3M. If HLF incorporated an LPO vendor into its offering, the Management & Supervision and Strategy would likely remain at 10,000 hours at an average of $520 FN3 per hour for a total of $5.2M. Assuming HLF retains 30% margins for this portion of the work, profits would remain at $1.56M. However, if the Review were outsourced to an LPO vendor at a cost of $45 per hour (a very conservative estimate) and HSC were allocated a price of $70 FN3 per hour, the profits of $25 FN3 per hour resulting from 30,000 hours of review would result in a margin of $750,000. Additionally, because only $7.3M of the $8M fixed fee has been allocated, the $700,000 unallocated portion of the fee is available to offset higher than expected volume of litigation discovery services or, if unused, to contribute to profits. As a result, profit projections for the same number of billable hours results in a margin increase from 30% to 38% and document review contribution to profits increase from $3.00M to $3.01M. At the same time revenue would decrease resulting in client savings of 20%, or $2M. Clearly these are hypothetical numbers and parties need to address potential extraordinary litigation and potential adverse incentives without providing relief for inefficiency or bad decisions. (See “Navigating Professional Ethics Issues in the Changing Legal Service Paradigm,” forthcoming from Susan Hackett at the Association for Corporate Counsel – available to Legal OnRamp Members here.) Though the number of cases, volume of work per case, billing rates and profit margins will vary from client to client and firm to firm, the potential benefits for both firms and their clients are significant enough that firms should evaluate whether they and their clients can benefit from alternative fees combined with LPO services. The professional ethics of bundling LPO vendor’s services in combination with alternative fees present significant challenges, and some of them have been explored in The Ethical Challenges for Law Firms to Embrace Alternative Fees & LPO. FN1 The author acknowledges that the quality of all LPO vendors is not the same. However, this analysis assumes that there are multiple LPO vendors and multiple law firms that provide very high quality document review services and that the prices of those reviews are reasonably modeled by this analysis. The author encourages comments on this and all aspects of this analysis. FN2 Large law firms may consider building wholly-owned offshore legal process centers (or “captives”) as an alternative to LPO vendors. However, captive profits can be elusive. For a discussion of LPO captives see BT Transitioning Legal Services Captive to UnitedLex. FN3 With fixed fees, hourly rates are used only as an internal measure of effectiveness and efficiency, but are not billed to the client. This entry was posted on Sunday, June 13th, 2010 at 7:37 pm and is filed under Uncategorized. You can follow any responses to this entry through the RSS 2.0 feed. Both comments and pings are currently closed.